The answers for these FAQs come directly from customers. Q: How do I clean my EverSaw 8.0? A: I usually use just plain warm soapy water and an old rag. I wipe off any ick that sticks to my blade. However, after a few hours of cutting up some hemlock for firewood, my saw was coated in resin. For that, I used some rubbing alcohol and a scrub brush and it came right off! Q: What does “pull stroke” mean? How does that affect how I cut with my EverSaw?? A: Pull stroke means that the cutting action is primarily when you are pulling the saw. Pull cut saws (also known as Japanese saws) automatically tension the blade straight as they cut and create straighter, more accurate cuts. Pull cutting creates a gentler pressure, making the blade bind or stick less, and requires less effort and exertion. Use more pressure on the pull than the push stroke to get the best and easiest cut with your EverSaw 8.0. Q: How do I tighten or loosen the blade on my EverSaw 8.0? A: Simply use a flat head screwdriver (or a penny) to turn the metal screw head at the base of the blade. Lefty loosey; righty tighty. A: At this time, the price of a replacement blade plus shipping would only be a few dollars less than buying a whole new saw. With that in mind, we do not offer replacement blades. A: I have found that by the time I need a new blade, I should just replace the whole saw. I use my folding saw A LOT but these things are sharp and stay that way for way longer than any other I’ve used. Q: Will the blade bend and wobble when I am cutting? A: The blade on the EverSaw 8.0 is flexible. This is not a flaw but rather a deliberate design so the saw can hold up to whatever you cut without snapping or breaking. This saw cuts on the pull stroke, if you notice a lot of bending check your strength on the push, you may be more forceful than you need! Q: While cutting down a tree on my property, I noticed that every once in a while my saw blade would lock past the open position. Why does it do this? Is there any way to prevent this from happening? A: I have found that when I cut limbs larger than the recommended diameter (4″) mine has occasionally done this too. It only does it when I am cutting big stuff, so to prevent it from ‘locking past open’, just stick with cutting the smallerl stuff. 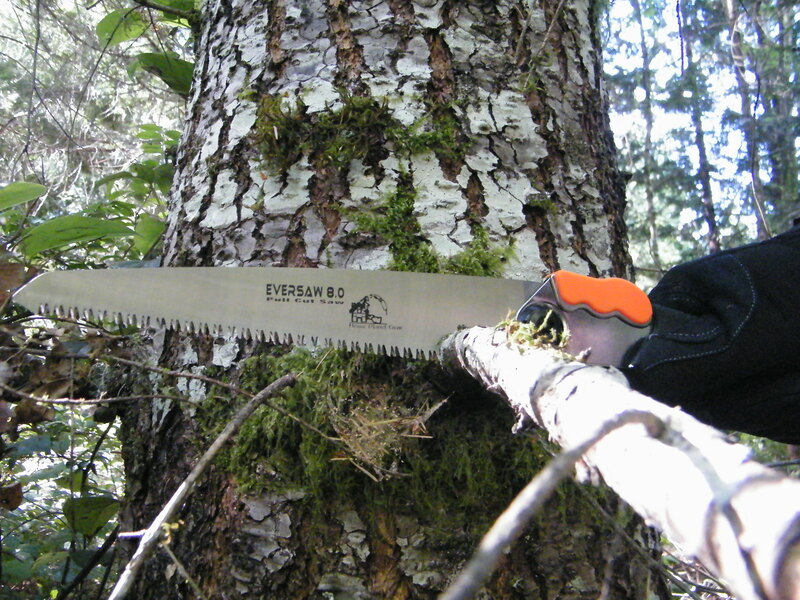 It’s easy to forget that the EverSaw 8.0 isn’t a huge saw as it cuts through just about anything like butter! A: My saw did something similar when I had tightened the nut a little bit too much. There is definitely a sweet spot when it comes to how tight or loose to keep your blade.